We live in a world of short-term memories and long-term memory deficiencies. If the 24-hour news cycle was any indication, Americans appear to be bouncing from one catastrophic mass shooting to the next, with hardly any breathing room. Like this is just a regular occurrence America has learned to endure because… guns. It’s the prevalence of firearms in the hands of the people, the anti-gunners say. Calls to limit, rewrite, redefine, or outright dispose of the 2nd Amendment are rampant. But no one is looking at the data. If they did, they would realize something is really, really, really wrong here. No, there haven’t always been so many mass shootings. It hasn’t always been this way. 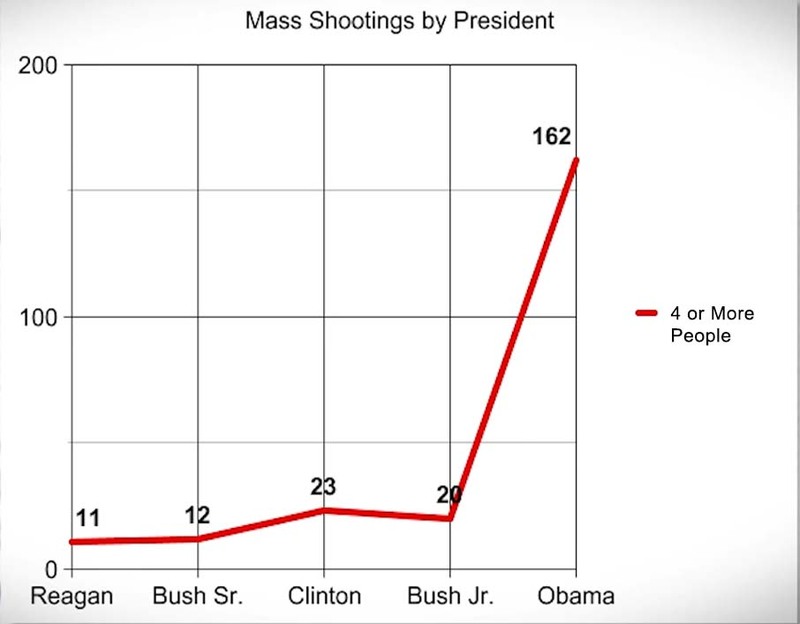 Mass shootings have skyrocketed in this country just in the last seven years under President Obama. The following was compiled using the database over at Mother Jones on mass shootings in the U.S. from 1982—2015, up to and including the shooting at Umpqua Community College in Oregon on October 1st, 2015. It also includes the Wikipedia lists for mass shootings in the United States by year and postal killings in the U.S. The following analysis considers the FBI’s definition of a mass murder, which is defined as “a number of murders (four or more) occurring during the same incident, with no distinctive time period between the murders”. Look at the difference between all other presidents and Barack Obama. Notice anything here? 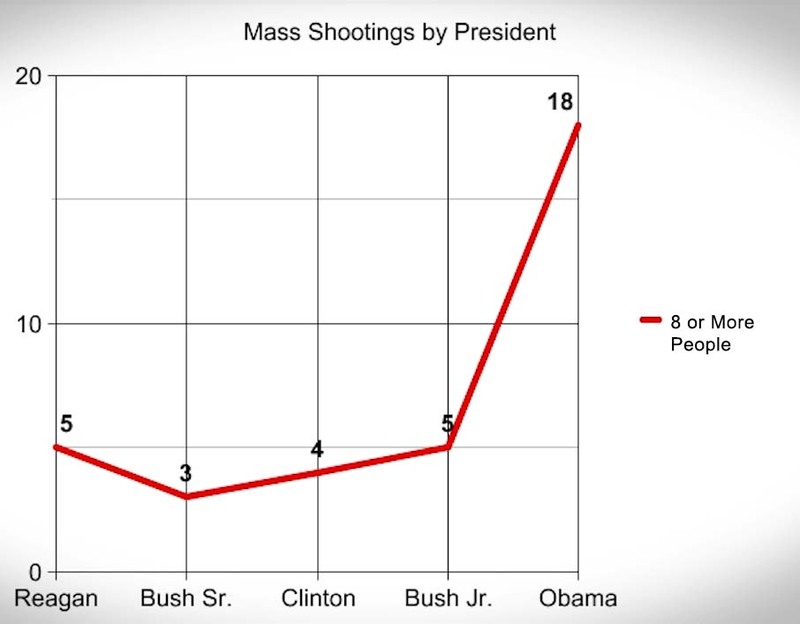 We’re talking about a more than six-fold increase from the number of mass shootings in the eight years Bush Jr. was president compared to the last seven years under Obama, and his 2nd term isn’t even up yet! Obviously this isn’t so easily simplified as more guns in the hands of more crazy people, the way the media likes to spin it. We have more gun laws now than ever before. Less types of guns are legally available to the average citizen than ever before. We also have more “gun-free zones,” zones where, just by the way, most of these shootings happen (because mass shooters do not follow laws or care about zones, obviously). So that’s not it. We have debated whether or not antidepressant medications are playing a role in these events. Even a cursory glance at the SSRI stories school shootings database would suggest there is some substantial evidence behind this theory. We know that many of these mass shooters were either on psychotropic medications at the time of the shooting, or withdrawing from them. However, Prozac was approved for use in the United States back in 1987. Antidepressant medications have been around and in widespread use in America for decades now. That factor alone cannot entirely explain all these mass shootings recently. Not to mention that five out of the 12 deadliest mass shootings in American history have happened not just since Barack Obama became president, but just under his first term as president alone. That’s nearly half. Something else is going on here. After the controversial Sandy Hook shooting, Obama passed 23 gun control executive orders. He continually says wants to do more and he’s frustrated with how limited his powers as mere president are. He continually mentions wishing America’s gun control mirrored that of the UK and Australia, two countries that passed strict, sweeping gun bans following what many have called single mass shooting false flag events which happened just weeks apart in March and April 1996. “It was just so shocking the entire country said, ‘Well, we’re going to completely change our gun laws’, and they did. And it hasn’t happened since,” Obama said, discussing the shooting deaths of nine people at a historic black church in Charleston last week. The suspicious April 1999 mass shooting at Columbine High School didn’t accomplish nearly the same gun control implementation here in America, although it did happen under another highly pro-gun control president, Bill Clinton. Perhaps one false flag just isn’t enough in a country that has been built upon a Constitution with a Bill of Rights and a 2nd Amendment right to keep and bear arms. Perhaps it can only be killed death-by-a-thousand-cuts style. Now Obama says gun control will be his #1 top issue of focus for the last year of his final term as president. He says his biggest frustration has been his inability to pass more gun control legislation. But when did it become the new normal? 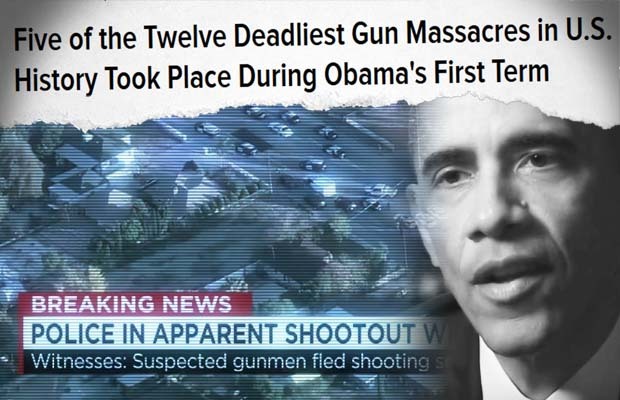 While the 2nd Amendment continues to be attacked each and every time another mass shooting occurs, just realize something: these events were never this “routine” until Obama became president.